MEMPHIS, Tenn., March 15, 2017 /PRNewswire/ -- Verso Corporation (NYSE: VRS) today reported financial results for the fourth quarter of 2016, including net sales of $646 million, net income of $8 million, and adjusted EBITDA of $92 million, which includes a $25 million gain on the elimination of certain post-retirement benefit obligations. For the full year 2016, results for the predecessor and successor companies are shown below. Restructuring charges increased $108 million for the 12 months of 2016 compared to the same period of 2015. Restructuring charges for the 12 months of 2016 consisted primarily of non-cash fixed asset write-down charges from the closure of the Wickliffe Mill. 2015 includes restructuring expenses associated with the NewPage acquisition and the Wickliffe, Androscoggin and Bucksport facilities. Verso's performance in the fourth quarter of 2016 showed improvement over the third quarter of 2016 as operational performance improved and maintenance costs declined. The Company previously announced a temporary idling of a paper machine at our Androscoggin Mill. Net gains associated with the Chapter 11 Cases. For 2016, charges are primarily associated with the closure of the Wickliffe mill, of which $137 million is non-cash. For 2015, charges represent severance and employee related costs and other restructuring charges associated with the NewPage acquisition, and the closure of the Bucksport mill. Non-cash charges related to the one-time impacts of adopting fresh-start accounting. Realized (gains) and losses on the sale of assets, which are primarily attributable to the sale of hydroelectric facilities in January 2016. Costs incurred in connection with advisory and legal services related to planning for and emerging from the Chapter 11 Cases. Amortization of non-cash incentive compensation, unrealized losses (gains) on energy-related derivative contracts, Wickliffe operating costs while idled, and miscellaneous other non-recurring adjustments. In this press release, all statements that are not purely historical facts are forward-looking statements within the meaning of Section 27A of the Securities Act of 1933 and Section 21E of the Securities Exchange Act of 1934. Forward-looking statements may be identified by the words "believe," "expect," "anticipate," "project," "plan," "estimate," "intend," "potential" and other similar expressions. Forward-looking statements are based on currently available business, economic, financial, and other information and reflect management's current beliefs, expectations, and views with respect to future developments and their potential effects on Verso. Actual results could vary materially depending on risks and uncertainties that may affect Verso and its business. Verso's actual actions and results may differ materially from what is expressed or implied by these statements due to a variety of factors, including those risks and uncertainties listed from time to time in Verso's filings with the Securities and Exchange Commission. Verso assumes no obligation to update any forward-looking statement made in this press release to reflect subsequent events or circumstances or actual outcomes. Verso will host a conference call on Wednesday, March 15, 2017 at 3 p.m. (EDT) to discuss fourth quarter and year end 2016 results. Analysts and investors may access the live conference call only by dialing 888-317-6003 (U.S. toll-free), 866-284-3684 (Canada toll-free) or 412-317-6061 (international) and referencing elite entry number 1755468 and Verso Corporation. To register, please dial in 10 minutes before the conference call begins. The conference call and presentation materials can be accessed through Verso's website at http://investor.versoco.com/ by navigating to the Financial Information page. 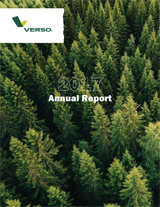 This release and Verso's annual report on Form 10-K for the period ended December 31, 2016, will be made available on Verso's website at http://investor.versoco.com/ by navigating to the Financial Information page. A telephonic replay of the call can be accessed at 877-344-7529 (U.S. toll-free), 855-669-9658 (Canada toll-free) or 412-317-0088 (international), access code 10102869. The replay will be available starting at 5 p.m. (EDT) Wednesday, March 15, 2017, and will remain available until April 15, 2017. An archive of the conference call and webcast will be available at http://www.versoco.com/ starting at 5 p.m. (EDT) Wednesday, March 15, 2017, and will remain available for 120 days.